I just love quinoa – and I’m a big fan of butternut squash. Quinoa is easy to cook (really) and so healthy for you. Not only is it packed with protein, it’s also low in cholesterol, carbohydrates, and has hardly any calories. With a nutty, crisp flavor, it’s great as a side or main dish. And, butternut squash isn’t anything to complain about either. Full of antioxidants and also low in calories, butternut squash can be enjoyed savory or sweet. This was our winner from last week’s dinners, and I enjoyed the leftovers cold the next day for lunch. Even if you’ve never cooked quinoa before, you’ll have success with this dish – really, it’s that easy. And, hey. Not a fan of blue cheese? Leave it out – or crumble some feta or shred on some Parmesan. Start by cutting off the skin from the butternut squash and then cutting in half. Scoop out the seeds and then chunk the squash into 1-inch pieces. Go ahead and crank your oven to 400 F and dig out your biggest non-stick-but-safe-for-the-oven sauté pan. 12-inches is a good size, and if you don’t have a non-stick, you can use a regular one – things might just stick a bit. Slice and dice the onion and garlic and add to the butternut squash along with a couple of good dashes of salt and pepper and the water and olive oil. Give things a stir and then toss into the hot oven. Now get 2-cups of water boiling with a dash of salt. Once things are simmering away, add 1-cup quinoa, turn down the heat, and cover things up for about 10-minutes or so. Check back every once in a while to make sure your quinoa isn’t burning at the bottom or to add more water if things look dry. Give things a stir and then taste for doneness. You should end up with lots of itty-bitty swirls that are nice and tender and fluff with a fork. Turn the heat off under the quinoa and leave covered. Give your butternut squash a stir and keep on roasting for another 20-minutes or so. While the squash is finishing up, wash and dry your fresh spinach and add to a nice sized mixing bowl. Give your butternut squash a doneness test after about 30-minutes of roasting by poking a chunk with a fork. If it goes in easy, you’re ready to go. Pull the squash out of the oven and dump in your quinoa. Give things a gently toss and return to the oven for another 5-minutes to toast up the quinoa. 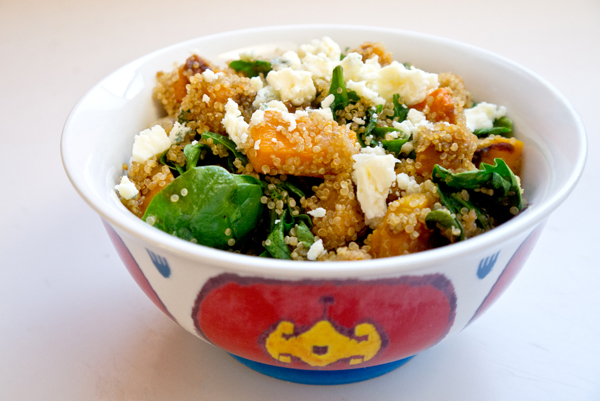 Mix the hot butternut squash and quinoa with the spinach and then top with the blue cheese. You can also add another drizzle of olive oil and add additional salt and pepper to taste. This sounds really good, and I adore bleu cheese. I bet it tastes amazing with the squash and quinoa.